The latest software version for your Logicube product is listed below. We provide frequent software updates to add features and improve performance. 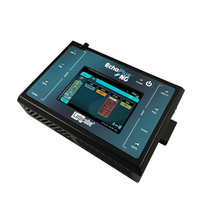 The EchoPlus-NG software can be updated directly from the EchoPlus-NG via an internet connection or you can download the software from our website to a USB drive and then upload to the EchoPlus-NG. Please refer to the EchoPlus-NG users manual, the readme.txt on this page or contact Logicube support for instructions. If you need assistance in updating the software on your Logicube product please contact our technical support department at support@logicube.com or 818-700-8488. Overall, I’m very satisfied with the Logicube Forensic Dossier. I have had a couple days this year where I imaged twice as many computers as some of my colleagues using older imaging utilities in the same amount of time, and that made them very jealous.